If you are considering replacing your microwave oven, you may not be aware of the latest improvements and what is on the market now. We have put this guide together to help you decide which is best for you and your pocket. The Panasonic NN-CT585SBPQ is a full-sized, combination microwave oven and grill. It has a compact design to slot neatly into a designated area and has a 27-litre capacity. The design is simple but solid, the controls easy to manage and what is most important, it cooks well. This Panasonic has a simple design with an all-over brushed stainless-steel finish which doesn’t show fingerprints. It is built solidly, and the controls respond easily. Although it isn’t small, it is compact and allows for extra space in front of the appliance. There is a displayed scrolling text guide for operation, explaining how to use the microwave but you can turn it off, if not needed. Included is a wire grilling rack, plus an enamel tray that can be used for both grilling and baking. Both can be stored neatly in the microwave when not in use. The Panasonic NN-CT585SBPQ boasts an inverter. A magnetron, which is the device inside the oven that makes microwaves, can only be switched on or off. You can’t turn it down to low power. However, this model and other Panasonics, have an inverter, which means the magnetron uses power from an alternate current. In this way, the six power levels can be precisely controlled instead of just being switched on and off. One negative part of the design is the length of the power cable which is only 1M long is placed high up on the righthand back of the oven. This is very limiting when trying to place the appliance. The Panasonic is simple to use, the controls are intuitive, and you couldn’t get better cooking results. It has high-quality performance which you would expect from a more expensive model. The first time you use the appliance it needs 5 minutes on 220°C to clean the interior. The grill is suitably powerful, and since the food is quite close to the element, you need to turn food frequently to ensure you don’t burn it. There is a combi jacket potato program which works really well. For example, a 460g potato takes roughly 15 minutes on the enamel tray. The results are that it is lovely and soft on the inside but crisp on the outside, just like a real oven-baked potato rather than the usual microwaved ones. Defrosting is also excellent for this price range. 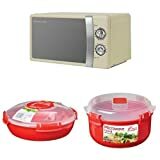 This is an exceptional microwave for the price, it is basic-looking but does a really good job of cooking and doesn’t take up much space. We highly recommend it. The Panasonic NN-CS894S is a large, family-sized combination microwave and oven which both grills and steams. It has a flatbed instead of the usual turntable. This enables it to cook and reheat large dishes of food. It also has the steaming function and multiple programs. This model is exclusive to John Lewis. The Panasonic NN-CS894S is not only large but much taller and heavier than other microwaves. The door opens downwards like a standard oven which is safer. With a 32-litre capacity, it is ideal for cooking for the family, and the flatbed design makes it easy to reheat or cook food in a large rectangular dish. There are three shelf positions which come with different shelves: wire, glass, enamel and a steaming trivet. Below the door, there is a drip tray on one side and a reservoir for steam cooking on the other side. There are multiple touch-sensitive buttons: microwave, steam, grill, convection and various combinations of them all. These all have icons, and instead of a knob, there is a touch-sensitive slider: you can either tap on the plus or minus, or drag your finger across it to adjust the cooking time. The appliance is self-cleaning with catalytic linings on the top and back. Spills can just be wiped cleanly away. It also has an inverter. A magnetron, which is the device inside the oven that makes microwaves, can only be switched on or off. You can’t turn it down to low power. However, this model and other Panasonics, have an inverter which means the magnetron uses power from an alternate current. In this way, the six power levels can be precisely controlled instead of just being switched on and off. This Panasonic model has 8 steam-only and 8 auto-steam with microwave programs. This means you can cook fish and vegetables in a healthier way and preserve nutrients. Steam can also improve rising properties on bread, cakes and pastries with its 3-minute steam boost. Oven temperatures range from 40°C, which is wonderful for proving bread, to 230°C for baking bread and pizza. Be prepared to take a bit of time getting used to the controls on this appliance. Since the buttons are all icons, it takes a while to sort out what is what. Once you get used to them, it is easy and makes sense. When you push an icon button, it immediately tells you exactly what it is on a large display with scrolling text. So, you don’t have to worry about making a mistake, just cancel and hit the correct button. This display also explains the various accessories and advises which type of shelf to use and in what position. The microwave senses when cooking is complete with the auto-sensor program. While the touch-sensitive slider bar is agreeable to use when programming, it can also prove frustrating. You often have to press the convection button repeatedly in order to reach the correct temperature. Then you use the slider bar to set up the cooking time and repeat all this for each stage of cooking. Do not use the plus/minus on the slider bar to set the temperature as this will just botch everything up, and you will have to start all over again. You will soon get used to it though. Steaming works well for baking cakes, you can’t see the steam but can hear water being pumped out of the reservoir. The cake will rise visibly and have a nice texture. Grilling is good on this microwave with no risk of burning if you pre-set the cooking time. The ‘Chaos Defrost’ which pulses randomly isn’t much different from an ordinary defrost setting. If you have a large family and enough space to accommodate this appliance and can afford it, then the Panasonic NN-CS485S is well worth the money and won’t disappoint you. This appliance gives two extra shelves of cooking space, as well as microwaving and a steam oven for healthier cooking. The Sharp R861SLM is a combi microwave, grill and convection oven with a modern, elegant design that has stainless steel highlights which makes it look more expensive than it is. It has a pull-down door and controls are intuitive. It cooks quite evenly, but the appliance can occasionally vibrate noisily. The Sharp has an attractive brushed stainless-steel exterior with a black glass door finish and will look elegant in any kitchen. A bonus is that fingerprints don’t show up on the surface. It has a flatbed design instead of a turntable which means more cooking space. The appliance is deeper than most microwaves and takes up quite a bit of space, but it has excellent non-slip suction feet, and once in place, it won’t move about. The control buttons and display are on the right-hand side and easy to understand. There are buttons to select the time in 10-minute, 1-minute and 10-second increments. Defrost by weight or by time; you can select different cooking methods such as microwave, grill, oven or a combination of these. There is a clock, kitchen timer, delay timer and child-safety lock. The six auto-menu functions are jacket potato, pizza, rice, oven chips, cake and roast chicken. There are seven more functions from the up and down buttons: auto-reheat, beverages, vegetables, soup, grilled bacon, grilled fish, roast beef/lamb. When the oven door is open, there is a handy reminder across the top explaining what these functions are. It is not, however, very clear when to use the supplied wire rack and baking tray but since they are both metals, you obviously should not use them in any combination with the microwave. The tray fits neatly under the wire rack but not on top of it, and there is no explanation as to whether you should use them together. It isn’t clear as to why both of these items are circular either. The pull-down door is convenient and safe to use; the controls are intuitive and easy to use. Defrosting is quite intense and may not need as long as stated on the defrost menu. The grill is fast, and the precise cooking and timer ensure that you grill evenly without burning. The convection oven is fairly noisy due to the fan and occasionally vibrates enough to make the tray wobble on the flatbed. It cooks evenly and well but it is best to use your judgement when using the auto-menu, you may need to cook your food a little longer or less. The appliance is really easy to clean thanks to the glass flatbed. The Sharp R861SLM is an affordable combi which will elegantly grace any kitchen. It is well worth the money and cooks well but be prepared for some noise and vibration from time to time. The Beko MOF 20110 is quite expensive but certainly worth the money and is a compact appliance. Its capacity is fairly small, and there is no grill or oven, but if you are looking for a basic microwave with uncomplicated controls, which cooks well, then this is a great buy. The Beko is compact and basic but still has 8 auto-programs: Reheat, Vegetables, Fish, White Meat, Pasta, Potato, Pizza and Soup. You select the quantity, and Beko picks the cooking time. You can cook on five different power levels, defrost by weight or time and press the Start button for full power in 30-second increments. You can also cook in two stages, one after the other. It features a clock, kitchen timer and child-safety lock. The design is simple with a stainless steel control panel and black glass door. There are six control buttons and a knob. Inside the door, there is a sheet to remind you of the eight auto-programs. The Beka defrosts quickly and well. Cooking on the auto program is easy, you select it from the eight programs using the knob and press Start. You also use the knob to select cooking weight: 200, 400 or 600g. The glass turntable is a nuisance to clean, but luckily the Beko plate is safe to put in the dishwasher, as is its roller ring. The Beko MOF 20110 is compact and affordable, if you are just looking for a basic microwave with a set of programs, this is ideal and a good buy. The Sage Quick Touch Crisp is a microwave-grill combi which has a massive selection of cooking programs to choose from. It also has a crisper pan for all-around cooking and intuitive controls. It is high-end and expensive. The Quick Touch Crisp is a microwave-grill combi with a polished stainless-steel finish. It boasts a 290mm Crisper Pan on legs which fold down for grilling and fold away when you want the pan down low, or for storage. It has an inverter which regulates microwave power to create more even heating. You can cook in a basic manner or select the Smart Cook/Grill, Smart Reheat or Smart Defrost modes from the control panel on the right. There are written menus to choose the food type; you can do virtually everything from roasting vegetables to toasting nuts. There are ten shortcut buttons located just inside the door: One is for saving your favourite program, and one is for grilling, the rest are for popular foods: beverages, baked beans, baked potato, pizza, grilled cheese, caramel, melting chocolate, softening butter. There is a clock, kitchen timer, child safety lock and the Quick Touch Crisp provides you with the option to choose whether weight is displayed in grams or ounces. The controls and features are really impressive and easy to use. There is even ‘A Bit More’ button! A good way of testing a microwave grill is to try cheese on toast. Sage has a Grilled Cheese program which uses the Crisper Pan to heat up in the microwave in order to brown and crisp foods so that they don’t become mushy. It is great for pies, pizza and pastries. It first pre-heats the Crisper Pan for three minutes; then the instruction manual advises you add a slice of bread, buttered on both sides, halfway through the six-minute cooking time, turn it over and add cheese. The result is scrumptious, both chewy and crispy at the same time. The Crisper Pan holds up to three slices of bread, and you can keep an eye on it as the appliance is well lit inside the cavity. To cook a frozen pizza, select the Pizza program, there is a choice of fresh or frozen, choose whether to pre-heat the Crisper Pan and select the quantity of one to six slices. A single slice takes six minutes. The controls on the Sage Quick Touch Crisp are great. The knob on the left control’s items on the left of the screen and the knob on the right control’s items on the right. For food items which don’t have their own program, it is a case of trial and error. For example, defrosting pitta bread means manually selecting the power and defrosting time. However, setting the microwave is intuitive: turn the power knob to Defrost which will show onscreen, then use the right-hand knob to adjust the time. If not completely done, try the ‘A bit more’ button for an extra 10 seconds defrosting time. Sage has a shortcut program for the baked potato, just follow the instructions and use the Crisper Pan down low. When you turn the potato at half-time, you can judge whether it may need more cooking time. The results are excellent, just like an oven-baked potato. Cleaning the Crisper Pan is simple as it is dishwasher-safe. If you can afford it, this is a really great buy. Its gourmet features will appeal to the dedicated cook and the controls are easy to handle.